Flying to Finland – depending on where from, of course – can sometimes be pricy. That’s why it’s always a good idea to know what to do, in Helsinki especially, that won’t need us to spend a fortune once we’re there. Helsinki’s surface is one third green parks, and if you have driven in Finland you’ve surely noticed that the country is almost entirely a forest. There are 11 big parks just within in the city of Helsinki, and these parks were built at different times over the past centuries. Each one follows the park-building canons of the times when it was built, which makes visiting them a history lesson on its own. With so many parks, you know that there will always be one nearby to have a seat, relax and admire. These are the parks within the city: Helsinki Central Park, Eläintarha, Esplanadi, Helsinki University’s Botanic Garden Kaisaniemi, Kaivopuisto, Korkeasaari, Kumpula Allotment, Linnanmäki, Tuhkimo, and finally Uutela. Also, don’t forget to check out the Winter Garden (address – Hammarskjöldintie 1), the botanical garden of Helsinki, which has no entry fee. 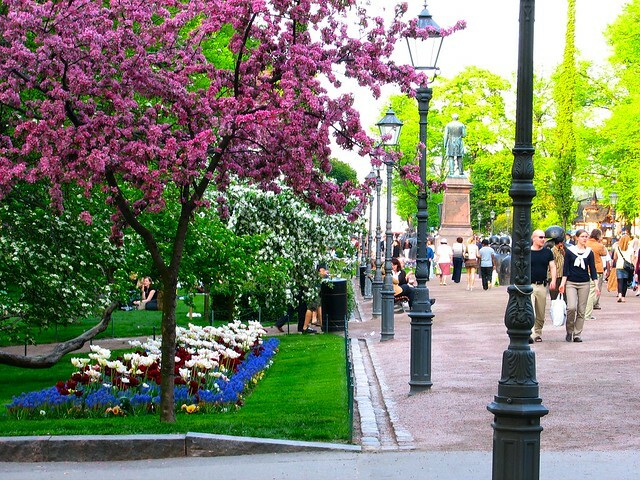 The Esplanadi park, a popular spot in the center of Helsinki. Source (CC: by) . If you are into this particular kind of park, the amusement park of Helsinki also has no entry fee. It has 11 free rides and the rest have a small additional charge. Nonetheless, even without taking a ride on any of the attraction, it’s a great place to hang and meet locals. Another thing that could answer the question of what to do in Helsinki includes a visit to one the city’s famous churches and cathedrals. For example, there’s the überdesigned Chapel of Silence. It has free entry as well and its design – as well as the materials it was built with – is spectacular. In addition, there are three more iconic churches in the city: Temppeliaukio (Lutherinkatu 3) – also known as the Church of the Rock – the white Helsinki Cathedral in the Senate Square, and the reddish Uspenski Cathedral, located near the market square. The last two of these churches lie in the main center of Helsinki. 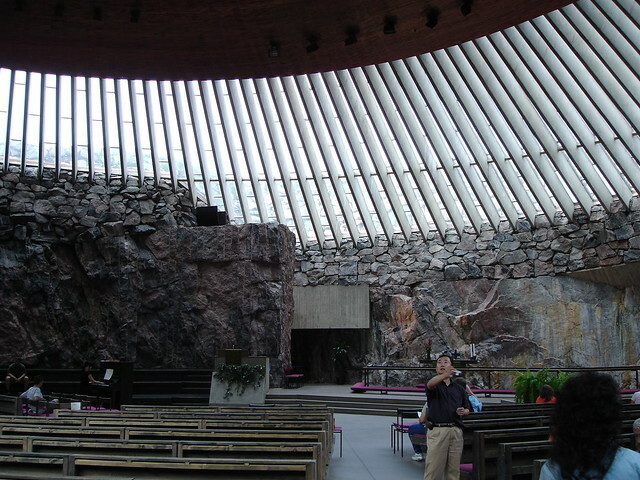 The Temppeliaukio church. Source . Helsinki has 7 big museums (the city Museums website has addresses and opening times ), all of which are free of charge. Other kinds of museums that don’t belong to the city museum network also have free entry at certain times. For instance, the Kiasma contemporary art museum, located at Mannerheimplatsen 2 can be visited for free on the first Friday of every month, between 5 and 8:30 p.m. The Museum of Cultures is also free. And if you ask yourself what to do in Helsinki with the kids, there’s always the “Children’s Town”, where they can run free in a historical setting. It has shops decorated in the stlye of the XVII century, schools from the last century and much more to discover. 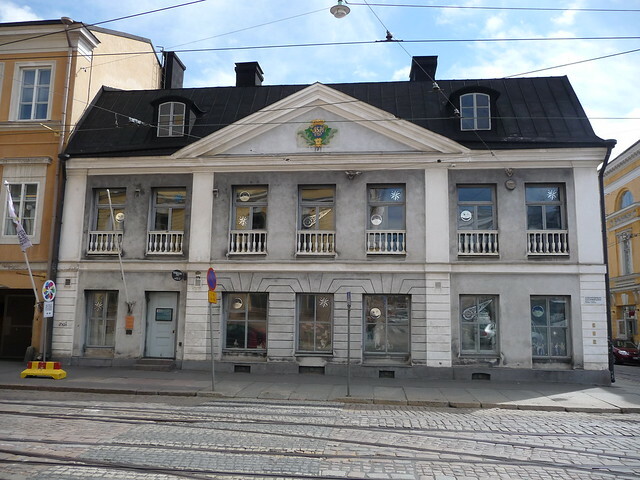 It is inside one of the 7 museums in Helsinki, at Aleksanterinkatu 16–18. Children’s Town is here. Perfect for visiting Helsinki with the family. Source . If the answer to the question of what to do in Helsinki has for you the word “Music” written all over it, the El Espa Stage is a good place to start. It’s in the Esplanadi park and is a space where each year between May and August, around 200 groups from Finland and abroad gather to play their music. With plenty of different music styles on offer, artists that are just getting started as well as some more established ones play in this relaxed and green scenario. On its website , you can check out all of the related events. 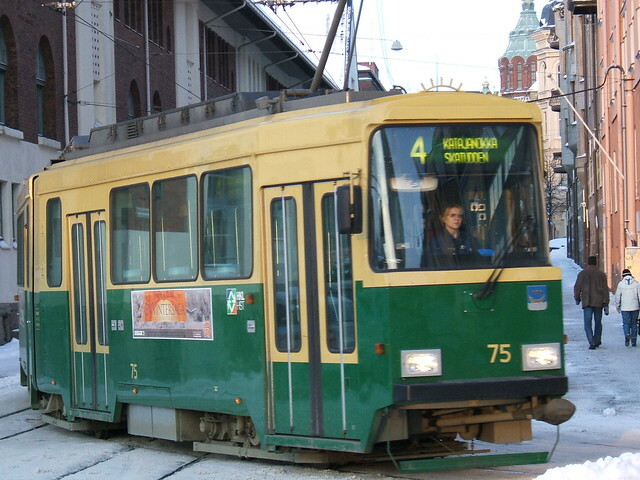 A tram in Helsinki. Source . If you want to visit everything in the center of Helsinki in the easiest way, tram lines 2 and 3 let you do just that. In 1 hour, the tram goes through the city’ most recognizable spots. It isn’t free, but almost: it costs around 2 Euro and follows the honour system of public transportation of Helsinki (meaning that there are no barriers to entry, but that your ticket can eventually be checked). Another great tour is taking the ferry from the Market Square and going to Suomenlinna island, a world heritage site that is definitely worth your time, and features a very well kept old fortress that used to defend the city in the early XIX century. The cost is the same as the tram if you take the public transport ferry, or you can go with the HKL ferry line for €3.60 return. Do you have another recommendation for what to do in Helsinki that is cheap, low cost or free? Help us out with your favourite Helsinki tourism tips in the comments below.